We use DePew Field part of the West Fields Complex on the 300-acre campus of Bucknell University in Lewisburg, PA, in the heart of the beautiful Susquehanna River Valley. 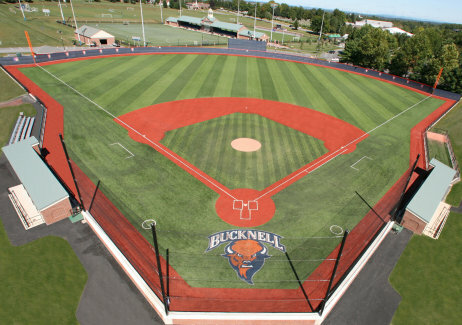 Bucknell’s campus is located adjacent to U.S. Route 15, just 6 miles south of I-80 and 55 miles north of Harrisburg, PA.
Namesake: Gene Depew, longtime Bison baseball coach and a 1971 graduate of Bucknell. Our winter camps are held in the Gerhard Fieldhouse. 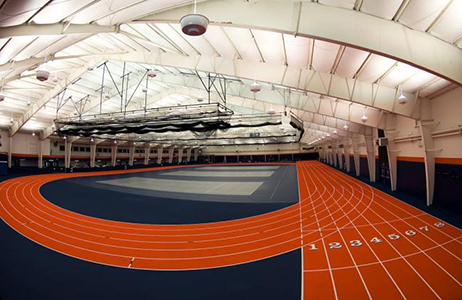 Gerhard Fieldhouse serves as Bucknell's indoor track and field facility, and the practice home of the Bucknell Baseball program during the winter months. The all-purpose main floor of the field-house includes a 200-meter track, courts for baseball-related activities, and a full-length batting cage.